Does a story of human teenagers with cursed demon weapons battling with vampires in post-apocalyptic Tokyo sound like fun to you? Then you’ll probably enjoy Seraph of the End: Vampire Reign. In the wake of an apocalyptic virus that kills everyone over the age of thirteen, vampires make their presence known to the world, collecting the remaining children to use as livestock in the depopulated world. Thus enter our two heroes, Yu and Mika. Raised in a vampire city where they are basically allowed to run free in the human ghetto as long as they give blood regularly, the two plan an escape along with the rest of their family of orphans. Sadly, however, the escape goes poorly for the children with all but Yu murdered—and Mika turned into a vampire. Now years later, Yu is a member of the human survivors’ anti-vampire task force—one that makes pacts with demon-imbued weapons in order to allow the humans to fight on a more equal footing with the superhuman vampires. Mika, on the other hand, patiently waits for the day when he is allowed to leave the vampire city and rescue his friend from the chaotic world outside. Yu’s arc in the story is largely one of survivor’s guilt. While he did manage to escape from the vampires, he believes that all of his family of orphans is dead—including Mika. This leaves him with one goal in life: revenge. At the start he is foolhardy to excess, counting on his rage to allow him to do the impossible—even when it doesn’t. He also is a loner, feeling that it would dishonor the memory of his family if he were to replace them with friends. Of course, over the course of the series, he grows to become friends with his squad mates, though this is for practical reasons as much as it is for emotional ones. One on one, vampires will almost always win due to their superior resiliency. Only by working as a team can humans stand toe-to-toe with them. So, by the end, he forms a solid emotional connection with them that is second only to the one he shared with his fellow orphans so long ago. Mika, on the other hand, is raised by the vampires—and by one of their leaders to boot. His life is one of contradictions. He is no longer human, but a vampire—one of the very oppressors who used him as a walking blood bank as a child. Yet, he does everything in his power to reject his new nature. He refuses to drink the blood of humans, going so far as to live on the blood of his sire alone. The vampires in turn are largely accepting of him, despite his quirks (as his sire is one of the head vampires), but he never accepts them. Mika hates them as much as Yu does for enslaving and murdering his family. While other vampires play politics, Mika cares nothing for prestige or spoils. The only thought that drives him is that Yu is somewhere in the outside world—all alone and thinking Mika dead with the rest. Thus he plays the vampires’ games to a minimum. He goes along just enough to show loyalty and assure that when the vampires finally head out to attack the humans, he will be included and will have a chance to finally be reunited with his brother. Perhaps the best trick of the anime is that Ferid, the anime’s most evil and despised character, is completely correct. Yu is an unknowing test subject for the titular “Seraph of the End” and has been drugged and trained to be the host of its powers. Potentially everything he has been through since escaping the vampire city has been to prepare him as a host: his school life; his subsequent military training; his making a pact with a high-level demon. Even his bonds with the other squad members—i.e., his reliance on teamwork and friendship—is simply an external means of controlling the power within him. It is a great and terrible revelation that changes how you look at all the preceding episodes. And that’s not the only area where the humans’ actions are questionable. After all, to fight the vampires, the humans regularly make pacts with demons and use powerful magic. In fact, this is the whole reason the vampires are attacking the humans instead of remaining in their cities. The humans could potentially destroy the entire world with something like The Seraph of the End. In their own minds, the vampires have no choice but to stop the childish human from playing with proverbial fire. While Yu may hate the vampires, from the viewer’s point of view, they are hardly evil. Enemies of mankind? Sure. But they simply want to continue surviving and the humans are putting the world at risk. Of course, the humans’ drive to become more powerful comes as a direct response to the vampires’ physical advantages—and their enslaving of much of the remaining human population to use as food. In other words, it is a cycle that is set to spin wildly out of control as the mystical arms race continues. Outside of the lead pair’s character development and the subsequent clever twist, Seraph of the End is your standard, run-of-the-mill shonen fighting anime. All the common tropes and themes are there: the power of friendship, over-used character archetypes, a high school setting, a hot-head main character, the girl character who has to be responsible and rein him in, the “not quite” love interest, cool battles that are all flash and no substance—the list goes on and on. Not that this is necessarily a bad thing, but long-time watchers of anime will find little new to see in the action of Seraph of the End. The anime’s biggest weakness is that rarely, if ever, is there any sort of real tension. Outside of the first episode’s shocking death of Yu and Mika’s family, no main character is ever in believable mortal danger. Sure, nameless, faceless people die by the score, but our heroes face threats that should be the death of the whole group and yet they get through unscathed. At some point it becomes obvious that they will overcome whatever they face regardless of how much this undercuts the vampires’ strength—making them, as enemies, look incompetent, weak, or a mixture of both. This in turn devalues the anime’s otherwise excellent final action climax—because while it seems the heroes have very much lost, experience tells us that they’ll all be just fine. Seraph of the End: Vampire Reign is at its best when it is a personal drama exploring Yu and Mika—their growth since childhood and what it means for the pair should they be reunited. The amount of time spent looking at the vampires’ perspective on the whole apocalypse and what the remnants of humanity are doing is likewise interesting and appreciated world building. 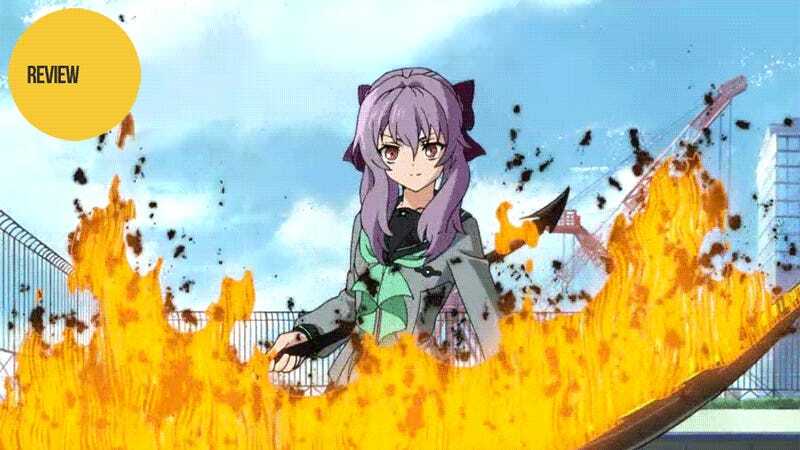 However, when it gets down to it, much of Seraph of the End is just another in a long line of shonen fighting anime. Though, that’s not to say that it doesn’t build a solid base for things to come. We’ll just have to see if it can break the mold a bit more in the show’s upcoming second season this fall. Seraph of the End: Vampire Reign can be viewed for free and with English subtitles in the US on Funimation and Hulu.